When Abraham laid his son Isaac on a sacrificial altar no witness was present but God. 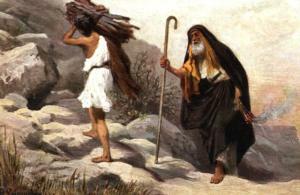 The Bible is silent on whether Abraham wept as he bound the boy to the firewood. The scriptures do not tell us whether he averted his eyes from Isaac’s frightened gaze. If we have ever loved someone dearly, however, we can imagine the turmoil raging in Abraham’s soul.